THE STORY - A family is forced to live in silence while hiding from creatures that hunt by sound. THE GOOD - John Krasinski's minimal story allows for him to flex his directorial muscles, focusing on tension, sound and emotion. THE BAD - The screenplay is filled with plot holes and some unrealistic character decisions. ​​​​John Krasinski teams up with his wife Emily Blunt for his third directorial feature called “A Quiet Place” and the result might just be his most successful yet. We saw him flex his dramatic muscles in 2016’s “13 Hours: The Secret Soldiers Of Benghazi” but here he does so much more with oh so little as far as his own performance goes. And his direction? It’s even better! Crafting a minimalist genre film that is heavy on intensity, emotion and dramatic stakes, John Krasinski the director, finally manages to impress with this tense horror film. However, an eye-rolling screenplay with one too many plot holes and astoundingly awful character choices hold this film back from being hailed as a classic of the genre. A race of horrific monsters has wiped out most of humanity. They are blind but can attack at great speed and strength due to their sensitive sense of hearing. A father (John Krasinski) and his pregnant wife (Emily Blunt), try their best to build a life for themselves and their three children: their deaf but brave daughter (Millicent Simmonds), their fearful son (Noah Jupe) and their other four-year-old son. When tragedy strikes the family, they struggle to move on as a whole as grief, fear and the monsters threaten to rip them apart. Nearly 500 days since the initial attack, the family has only one goal: survive. “A Quiet Place” is filled with long stretches of silence throughout. The first audible lines of dialogue are not spoken until nearly 40 minutes into the movie. This presents Krasinski with an interesting challenge to tackle on his third feature film as a director: How to tell a story with mostly visuals and sound? It feels like something one would be tasked to do in film school and Krasinski makes what pretty much amounts to a very good looking student film of sorts. It’s steeped in the horror genre, has very few sets and focuses its attention more on establishing a mood and telling a simple story with its tiny cast of emotionally charged performances. Character and story are kept to a bare minimum here as Krasinski’s camera glides through the set, navigating the actor’s faces of horror with a delicate and definite approach to the soundscape of his movie. For a film all about sound, you had better make sure that your sound department rises to the occasion and for all of the praise that Krasinski deserves in terms of how specifically his film is edited and scored, it’s the sound contained within “A Quiet Place” that is worthy of awards recognition. Featuring a character who is deaf, horrific monsters and an abandoned landscape where every minimal sound matters, the film is carefully able to create a sustained amount of dread which keeps you on the edge of your seat throughout its brisk hour and a half running time. The sound work and the musical score rise to the challenge in equal parts. The score builds anticipation when it needs to and pulls at the heartstrings when it needs to. 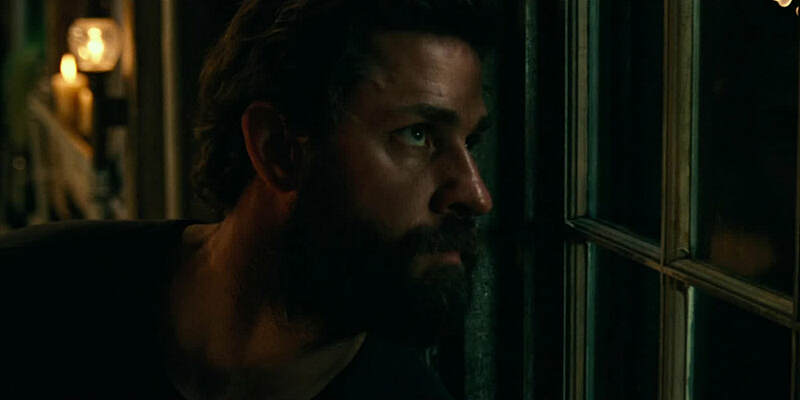 However, there are a handful of moments throughout “A Quiet Place” where plot holes (Why couldn’t the military defeat the monsters? ), unconvincing story narratives (Seriously?! You’re going to have a baby under these conditions?) and unbelievable character decisions (Millicent Simmonds is a talented actress as seen in "Wonderstruck" and once again in here but this screenplay makes her character completely self-centered and un-wise) all threaten to kill the picture and for some, this will be enough. If these moments don’t do it, the film’s final few minutes might, as the moments of horror begin to delve into "camp mode” resulting in a final moment before the credits that made my audience cheer, while others silently groaned. There’s a lot to appreciate in “A Quiet Place” but there is also a lot to criticize. My criticisms are almost negligible and do not take away from what I ultimately believe John Krasinski was trying to achieve with this film. This is not a message movie. This is not exactly high art. However, if a well-executed horror film with a relatable human element of survival and familial love sounds like a good time at the movies to you, then I certainly won’t stop you. Just please silent your phones and keep the noise level down in the theater. This is a very quiet movie and there are far worse monsters that will hunt you down should you choose to not be quiet.